As with all Brad Burt Private Lesson Teaching DVD's this one teaches each technique IN DEPTH. 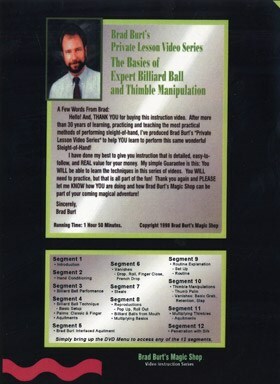 The majority of the DVD is on the popular Multiplying Billiard Balls with a solid selection of sleights with Thimbles added. One of the highlights is Brad's Billiard Ball routine which can be done for both Children and Adult shows AND it takes no special holders, etc. to perform. Very practical, magical and fun to do! This is excellent entry level sleight-of-hand for ages 10 to adult.